Team Coaching is a process which is underpinned by a set of competencies and skills rather than a leadership approach or style. This does not mean that personality and style are not important. Your unique personal style will, of course, influence the way each competency or skill is applied or expressed. 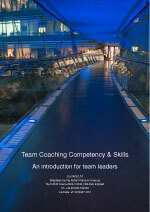 A set of team coaching competencies and/or skills is outlined below along with a short description of each. It is likely that you will already possess most if not all of these competences and skills to some degree. This will be through the development you have undertaken in the area of ‘one to one’ coaching along with your wider experience as a team leader. To support your own development planning you may find it useful to reflect on your own team coaching skills and competencies with a view to identifying which of these you would like to focus on when building your team coaching capability. Asking the right question, at the right time in the right way is fundamental to all coaching processes. When coaching teams, asking questions is a core competency and skill. Formulating questions for the team, rather than at the individual level involves posing questions with a wider focus. For example, they may be aimed at exploring team process along with options for supporting future performance. Capturing positives and learning points from the past is an advanced skill. As this is the case, then just as it is for individual coaching, if you work with a present and future focus whilst you are developing your team coaching skills, this will keep the conversation constructive and positively framed. What do we do well as a team? What could we do differently next time to build on our success? What are the key success factors for us in delivering our next project on time and under budget? After each question is posed, it is important that the response is heard. Listening is therefore, another core competence for every leader who coaches their team. What is different for team coaching is that you need to be able to listen to a range of different voices at the same time and in the same room. The challenge is to ensure that all the voices are heard and the unique contribution of each is taken into account. Reflection is a vitally important aspect of listening when coaching both individuals and teams. Reflection in coaching is about capturing the essence of what is said and presenting this back to the listener so they can hear that you have heard and understood what they have said. This is not the same as repeating back the same words. It is about capturing the meaning of what is said. Reflection in coaching enables you to sense check whether you have heard and understood what is said at a deep level. A good reflection of meaning provides opportunity for clarifications to be made. In team coaching reflection operates at two levels. Firstly, a well formed reflection will show that an individual team member’s contribution has been heard by the leader. Secondly, the reflection will take the needs of the wider team into account, by capturing what is meaningful for the individual in a form that is also meaningful to the team as a whole. Creating opportunities for others to contribute through the appropriate management of silence is another core competence in team coaching. Silence may be used naturally as part of the listening process to offer space for team reflection. In the team context silence may also have to be created through active management to ensure that each person is given the opportunity to speak during a team feedback process without interference from others. In team coaching it is the interactions between team members and how they combine or fragment when the team is engaged in its work that provides the input the leader needs to understand the underlying dynamics of the team. A leader may feel they have a sense of how the interactions may be working through indirect feedback offered or observed on a one-to-one basis, or where the work of pairs or larger subgroups in the team are known to the leader. However, it is only when the team is considered as a whole, dynamic system and observed over multiple time points that the full dynamics reveal themselves. It is important to be mindful that when the whole team dynamic is taken into account, issues which may have seemed simple can be revealed to be systemic. It is common, for example, to attribute all conflict between team members to personality clashes. The additional pressures associated with working with tasks, systems or processes that are in need of review and improvement can easily lead to interpersonal tensions. NB: Bringing the team together as a whole can be done virtually if it is not possible to bring them together for a face-to-face meeting. When coaching a team as a single entity, feedback from the leader as coach is framed at the level of the team and intentionally directed for the benefit of the team as a whole. Feedback between individual team members to reveal what they need from each other to perform well as a team, is also useful as part of a team coaching process. The most important factor is that the feedback is framed within the wider context of team needs, framed positively and with a future focus. When starting out as a team coach, keep all of feedback at the level of the team until you have developed confidence in managing the interplay between individual and group dynamics which is an advanced level of capability for a leader as team coach. In the team context every team member may have a different viewpoint and if left unheard and untended, the wider story can become fragmented into separate sub-plots. Each team member may have different information, experience or expertise that is relevant to the issue you are exploring. Combining all perspectives in a way that is respectful and complete is essential to building the shared understanding that forms the basis of effective team co-operation. Capturing and reflecting the key story back to the team is important so they can hear that you have understood, acknowledged and integrated all contributions to the wider picture. For the leader as coach, listening to all of the perspectives and supporting the team as a whole to draw the threads together in a meaningful way is a fundamental coaching skill. If the story of your team is complex or has been running without check for a long time, then finding and weaving sub-plots into a complete team enhancing story can require time and patience. The collective story of the team once captured, serves as a solid foundation for Team Identity. When captured effectively, the team story reflects an agreed common reality that accurately reflects the situation of the team. Each team member also draws personal security from the wider story as a holding frame through which adjustments to performance and process can achieve high performance team working. Related to the skill of working with stories, are the related skills of being able to frame and reframe information, perspectives and situations. At the beginning of the team process the framing involves the creation of a frame of reference for the team. A clear frame set out at the beginning of a new process or project, is important ‘scene setting’ at the beginning of a new team story. This frame can have a powerful influence on the way the team forms and works together. A clear frame, which is appropriate for the wider team objective will increase the likelihood that the team leader as coach will only need to make minor adjustments to support the team as they perform. A change in the circumstances in which the team operates [task/context] would require some reframing along the way. The leader as coach will be mindful of factors that impact on the team over time and, they will also reframe when this is needed. Framing and reframing are related to working with team stories and the creation of Team Identity. Personal identity is fundamental to an individual’s sense of self. In teams identity is similarly important because it is the team identity that provides an important frame of reference and belonging that makes team work more meaningful to individual team members. It is through the development of a strong team identity that the ‘I/me’ becomes ‘we’ and team members see their personal success as being inextricably linked with the performance of the team as a whole. Providing teams with a clear sense of identity, goes beyond the individual members of the team and runs deeper than the team names and symbols [Mascots/emblems] that are often used to create ‘team spirit’. A team with a strong identity will mourn the loss of its members when they leave and a new member joining is like welcoming a new member of the family. Coaching the team as a whole is fundamental to building Team Identity. Maintaining a strong positive identity through key times of change is important. This will support the grieving process when valued team members leave as well as ensuring that new team members are integrated effectively. Reinforcing or creating a powerful and compelling identity for your team is important coaching work. Conflict within teams is a common issue brought into individual coaching. When dealing with only one perspective in isolation the scope for resolving conflict can be more limited. When the team is brought together to explore and resolve issues as a team on a regular basis the early warning signs of serious conflict can be identified early and managed. A little constructive conflict can be good for teams. Early intervention when there is scope for more serious conflict to emerge is essential for high performance. Some leaders feel uncomfortable at the first sign of disharmony in their team. So, it is important to bear in mind that when team members are confident in both themselves and their interpersonal relationships, they will openly present ideas, disagree with each other and often engage in impassioned dialogue and minor conflict over opinions, ideas and solutions. High performing teams use the level of conflict that emerges from this kind of high engagement and confidence constructively. When the team leader responds at the right time they are able to harness team energy as well as preventing serious conflict from occurring. The leader as coach plays an active role in this process and holding ‘offline’ team coaching sessions to focus on specific issues of importance to the team can provide a holding space for team members to relax and engage in more dynamic ways than are possible during day-to-day work. NB: Coaching through serious conflict that already exists requires a high degree of competency in being able to ask appropriate questions, listen within a dynamic interpersonal environment as well as being able to work with strong emotions. Specialised supervision and mentoring for coaches and team leaders interested in developing their capabilities in systemic integrative coaching.